Speedy Diamond is the diamond buying branch of one of America’s largest independent jewelry stores, Windsor Fine Jewelers in Augusta, GA. When you work with us, you work directly with a jewelry store that pays top dollar because there's no middle man to take a cut of the sale of your diamond. Other diamond buyers that we compete with, have sent reps to our store to sell diamonds to us. (Boy, talk about an awkward conversation.) On top of that, we can wire you your funds in the same day for no additional charge. Why shouldn’t I send my ring to auction site? Is your quote a "firm quote"? Where am I actually sending my ring? What’s our process for coming up with a quote? What would cause my item to be requoted? How is my item insured? Today may be the day that you say "I need to sell my engagement ring." We'd like to tell you that it isn't as simple as it sounds. You want to get the highest value for an object that you may not know much about. The details that bring value to a diamond, are not something that you can easily see with your eye. This means that many times the person that is going to make you an offer on your diamond, is the same person that is going to tell you what kind of diamond you actually have. That can be terrifying, especially when the only information that you are equipped with - is how much the diamond or diamond ring was originally purchased for. Now enter the picture of trust. Why trust us? If we ever plan to by your engagement ring or diamond, we know that we have to earn your trust. 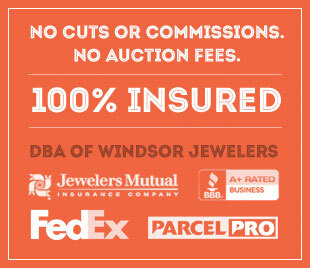 Speedy Diamond is the diamond buying branch of one of the largest independent jewelry stores in America, Windsor Jewelers, and we would love the opportunity to buy your diamond ring. Great transaction! I'll use Speedy Diamond again for my next jewelry sale or purchase. I found Speedy Diamond in a google search. Contacted them and they responded immediately. Shane was prompt, exact with his quote and followed up. He called me and explained the process and answered my questions. Read full review Detailed shipping instructions were sent to me and everything went as promised. I sold this time and the exact funds were in my bank account the same day they received my fed ex package. I've been looking at selling some old jewelry for quite some time. Every time I felt like the buyers at every other place were lowballing me. Shane not only gave me a great offer, but made the selling process fast and easy. Now I am finally rid of the cursed ring. Read full review If you need to sell some jewelry, Speedy Diamond is the first place you should go. I spent time and received quotes from diamond brokers, local jewelers and even pawn shops looking for the best price for my diamond engagement ring. In the mix, was Speedy Diamond. I was hesitant to send the ring to anyone, especially a place as new as Speedy Diamond. Read full review I received the best quote by far from them because, as they state, they ARE the end buyer, not an intermediary needing to take a cut. I took the leap and sent the ring to them, partly because I had a trail of emails and it's backed by a well-respected and established jewelry storefront (I was hesitant!). It was such an easy, speedy, straightforward, spelled out and pleasant process! The process went as the website lays out. Emailing and speaking with Shane, my contact, was nice and concise and helpful. He wanted the process to be as quick as possible. He was on it! He let me know the moment my ring arrived, verified the quote, gave me the options for payment, and it was done. I sent my ring to him on a Monday and by Thursday morning the check he had overnighted to me was fully credited to my bank account. Would have been sooner if I had the money wired (I was still hesitant!). Now, though, I'm letting the world know that Speedy Diamond is THE best place to use! Today may be the day that you say "I need to sell my engagement ring." We'd like to tell you that it isn't as simple as it sounds. You want to get the highest value for an object that you may not know much about. The details that bring value to a diamond, are not something that you can easily see with your eye. This means that many times the person or store that is going to make you an offer on your diamond, is the same store that is going to tell you what kind of diamond you actually have. That can be terrifying, especially when the only information that you are equipped with - is how much the diamond or diamond ring was originally purchased for. Now enter the picture of trust. Why trust us? If we ever plan to by your engagement ring or diamond, we know that we have to earn your trust. We'd like to start with telling you who we are, outside of Speedy Diamond. We’re a retailer, a “mom and pop” jewelry store, based in Augusta, GA, but we’re also in the top ten for largest independent jewelry stores in America. 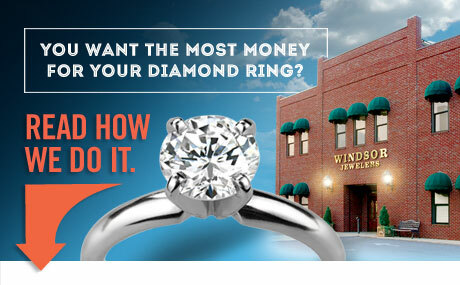 Our name is Windsor Fine Jewelers and we’ve been right here in the same shopping center since 1975. Chances are good that you’ll speak directly with a family member of the owner if you call us. Our record of success in the jewelry world has been absolutely built on trust - like you trust your mechanic, or your heart doctor - you have got to be able to trust your jeweler. We understand that selling a diamond ring is your top priority today, but tomorrow is another day - if there’s ever a moment you decide buy or sell fine jewelry again, we hope that you'll consider calling us again.